Evolving Mommy’s Virtual Holiday Cookie Exchange Day Four! Every December Maddy and I head over to my grandma’s house for a full day cookie baking extravaganza. Everyone in the family gets tins filled with cookies to enjoy and share with friends or co-workers. In last years cookie exchange I shared several of our favorites. The list of cookies that we make every year seems to grow and while we have a bunch of cookies my grandma has been making for years and years we also add in a new recipe here in there. Lime Meltaways? Newish. Peanut Butter Blossoms? Must have Christmas cookie for years and years and years. 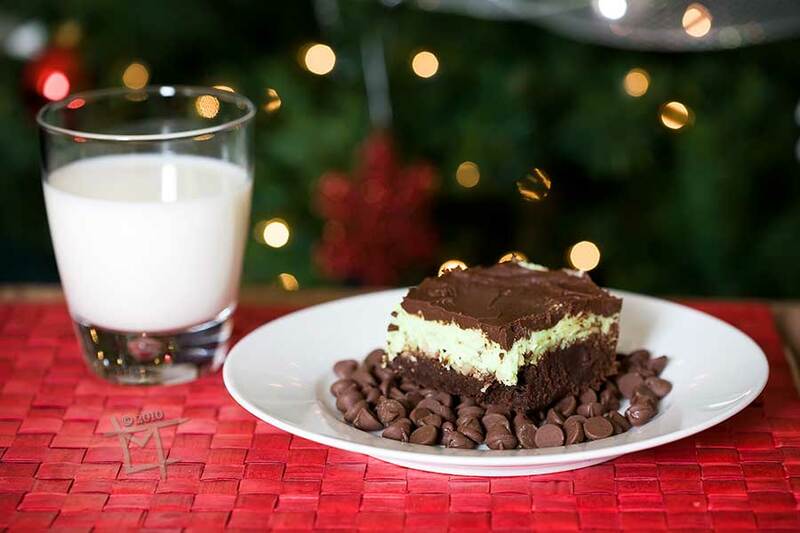 Chocolate Peppermint Brownies are definitely in yearly attendance in our cookie tins and plates. I love them. They are chocolately and dense and perfectly pepperminty. We usually make a double batch using a 9×13 inch pan and then cut them into little bite-sized squares, perfect for cookie trays. Thanks for joining in and sharing this recipe Grandma. I am sure everyone will love it as much as we do! Using a double boiler melt chocolate and butter. Once melted set aside to cool. In a separate bowl beat eggs and sugar until thick. Preheat oven to 350 degrees Fahrenheit and grease a 9×9 inch baking dish. Once chocolate is cool stir into egg mixture along with flour. Pour into baking dish and bake for 25 minutes. Cool brownies completely before moving on to step two. Beat ingredients until smooth and creamy. Spread filling over brownies. Cover and chill until firm. Melt chocolate and butter together in a double boiler. Stir in vanilla. Spread glaze evenly over brownies. Cover and chill. Store brownies in refrigerator. I think these will go on my list to make this year. Yum!